For customers who own the SIGMA USB DOCK and applicable products listed below, please update the firmware via SIGMA Optimization Pro. Before updating the firmware using the SIGMA USB DOCK, please ensure to update SIGMA Optimization Pro to Ver. 1.5.0. or later..
** When the Digital Lens Optimizer is switched [OFF], but "Peripheral illumination correction", "Chromatic aberration correction" and "Distortion correction", located within the in-camera Lens Aberration Correction function is switched [ON], the appropriate corrections can be achieved in accordance with the optical characteristics of each lens. It has improved the compensation effect when it is used in combination with the Sony a9, Sony a7III and specific lenses*, and their in-camera image stabilization adjustment is set to AUTO. It has been set to achieve the same effect as when it is adjusted manually. 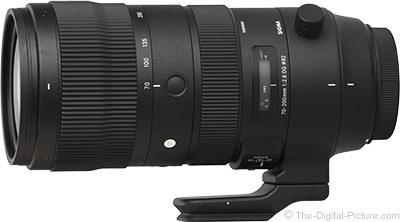 B&H has the Sigma 70-200mm f/2.8 DG OS HSM Sports Lens for Nikon in stock with free expedited shipping. We would like to share the results of our further investigations regarding the operating conditions of the Canon "EOS R" and SIGMA’s interchangeable lenses for Canon mount. When SIGMA’s interchangeable lenses in the current product lineup, listed below, are used in combination with the Canon "EOS R" and their "Mount Adapter EF-EOS R" or "Control Ring Mount Adapter EF-EOS R", both AF and AE operate without any issues. Furthermore, lenses which incorporate Optical Stabilizer (OS) will work with the OS function properly in effect. In addition, when the Digital Lens Optimizer is switched [OFF], but "Peripheral illumination correction", "Chromatic aberration correction" and "Distortion correction", located within the in-camera Lens Aberration Correction function is switched [ON], the appropriate corrections can be achieved in accordance with the optical characteristics of each lens. This is applicable to DG and DC lenses from Contemporary, Art and Sports line listed below which were released after March, 2018, or those of which firmware has been updated to Ver.2.0 or later. For other lenses, the Digital Lens Optimizer as well as the in-camera Lens Aberration Correction function cannot be used. Therefore, please set all to [OFF] before shooting. * Camera’s "Scene Intelligent Auto mode" cannot be used. Precautions for when DC lenses are used When SIGMA’s DC lenses where the image circle is designed to match APS-C sized sensors are used, "1.6x (Crop)" will not be set automatically. Please select "1.6x (Crop)" manually. There are future plans for a firmware update to be announced at a later date that will make the DC lenses from Contemporary and Art line compatible with the "1.6x (Crop)", to be set automatically, as well as Camera’s "Scene Intelligent Auto mode". It may require the battery to be taken out once, if restarting the camera does not work when the lens is taken off the camera while the lens’s OS function is in operation. SIGMA, Nikon F mount and Canon EF mount are scheduled to start the shipment in January, 2019. Launching date of Sony E-mount is not determined yet. It has corrected the phenomenon whereby Clear Image Zoom function incorporated in the camera cannot be used. It has added the “AF function button setting” to the customization menu. With this setting, it is possible to allocate various functions to the AF function button incorporated in the SIGMA 70-200mm F2.8 DG OS HSM | Sports. SIGMA Optimization Pro 1.5 is available for download here. 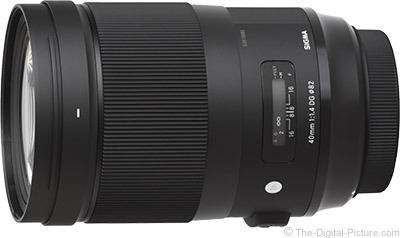 The Sigma 70-200mm f/2.8 DG OS HSM Sports Lens is available for preorder at B&H, Adorama, Henry's and Wex Photo. 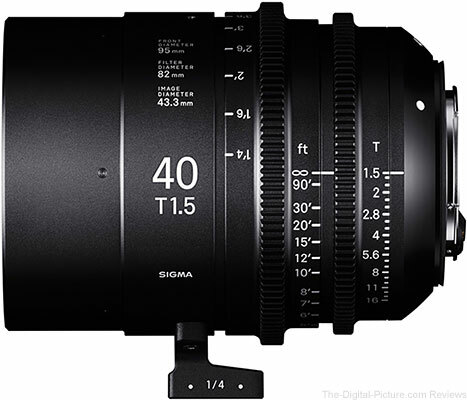 The Sigma 40mm T1.5 FF lives up to the performance standard required by high-end cinematographers as it achieves the highest optical quality as well as consistent rendering performance over the entire image circle. The lens produces one of the best MTF charts ever, making it an excellent choice for all levels of filmmakers. The Sigma USB Dock allows the user to connect the lens to a computer and update firmware, while the Sigma Mount Converter MC-11 allows users to enjoy the high performance of Sigma’s Canon EF mount interchangeable lenses with the Sony E-mount camera body. B&H carries Sigma Cine lenses. 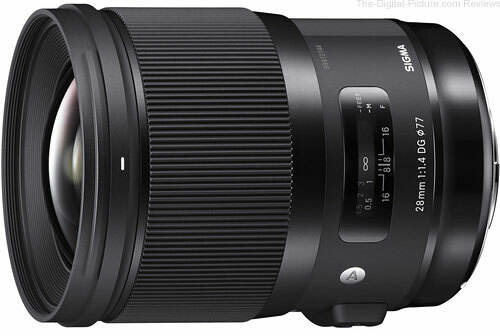 The Sigma 40mm f/1.4 DG HSM Art Lens is available for preorder at B&H and Adorama. 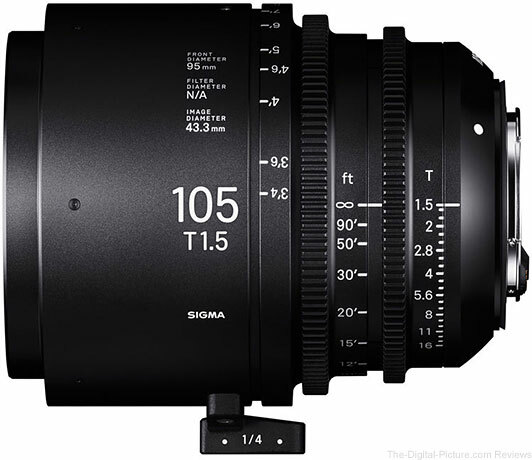 B&H has the Sigma 105mm T1.5 FF EF Mount in stock with free expedited shipping.